Taber Industries offers a variety of instruments that meet numerous internationally recognized test methods. We are confident that we can help solve your abrasion and wear problems with the Taber Rotary Abraser (Abrader), Taber Linear Abraser, Taber Grit Feeder, Taber Oscillating Abrasion Tester, Taber Multi-Media Abraser or another of our products. 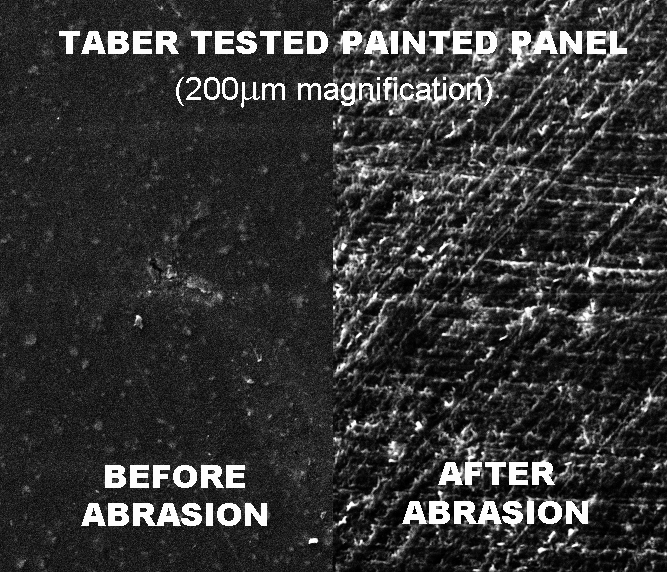 To learn more about any of our products, visit www.TaberIndustries.com. Attempting to recreate wear damage in a laboratory setting involves determining a complex combination of interrelated properties. Wear is a response resulting from the conditions to which the whole system is exposed. Resistance to abrasion is affected by the nature of abradant, variable action of the abradant over the area of specimen being abraded, tension of the specimen, the pressure between the specimen and abradant,the dimensional changes in the specimen, sliding speed, material composition and hardness, and environmental conditions. The objective of most laboratory tests is to provide predictive performance under a specified set of criteria and correlate with end-use performance. Yet when you evaluate the conditions a product is exposed to during its life, one quickly realizes the task of developing wear test methodology is both multifaceted and difficult. Nonetheless, laboratory wear tests have the potential to provide considerable insight into the various factors that contribute to a material's performance. A controlled laboratory test allows the user to approximate field conditions and eliminate extraneous variables. This enables the life span of a product to be compressed into a much shorter duration, and allows materials to be evaluated in the same manner within a controlled environment.